This post is updating in real time! Take caution as the information below is subject to change. Split up the Robes from the Coats. We’re legally obligated to tell you that it’s actually the doppelganger [Apprentice]. 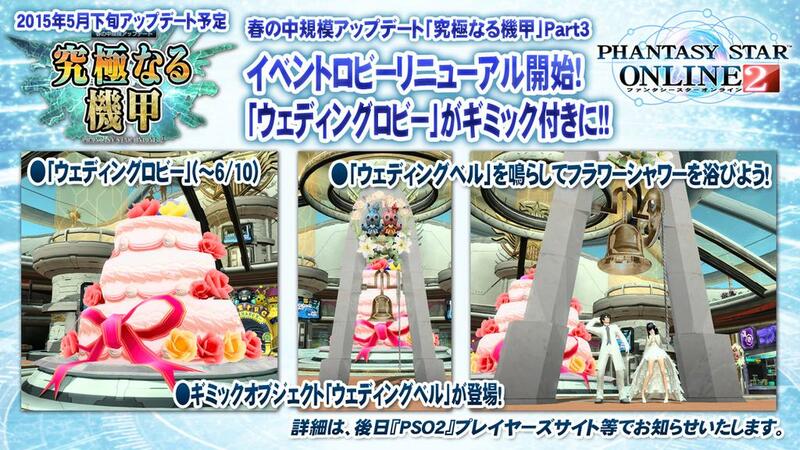 The PSO2 ARKS Caravan! Broadcasting live on the island of Shikoku! Attend the concert for an additional +10% boost. Say あわたろう in chat sometime between now through May 13th’s maintenance to receive this lovely accessory! Ring the wedding bells and experience a shower of flowers! Aquatic Ruins Team Room added! 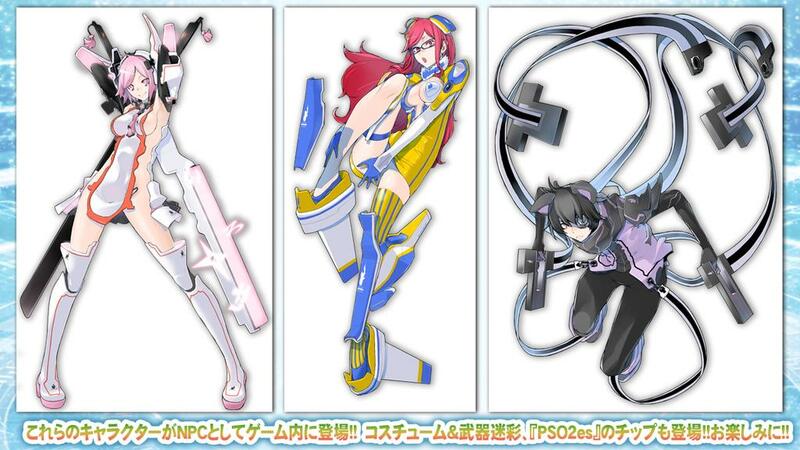 Limited Cast NPCs designed by Masaki APSY. Red Oni-hime Shiki will appear in the lobby handing out client orders. Clear the client orders to get the partner card. 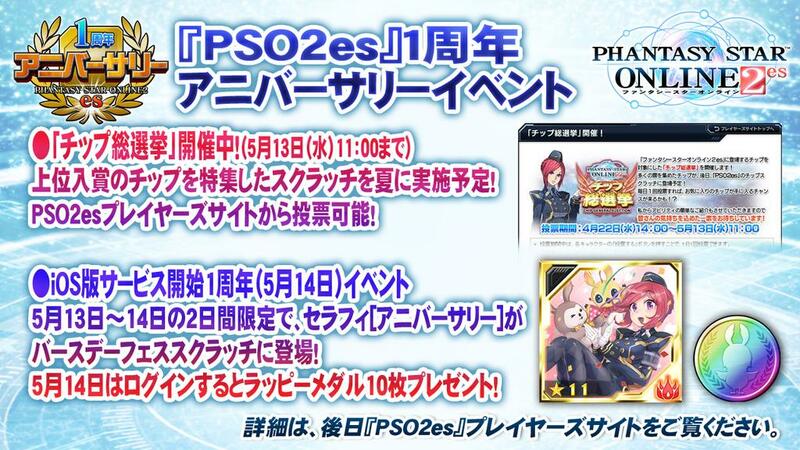 Shiki will also appear in Emergency Trials. 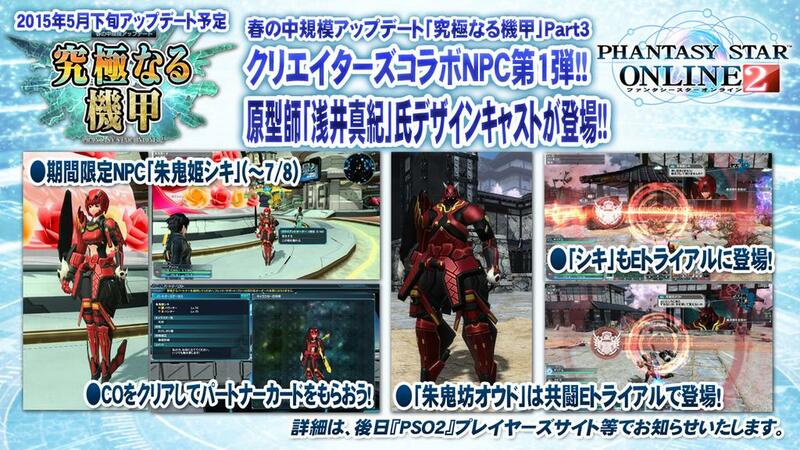 Red Oni Monk will appear in Emergency Trials. Ethnic robes and Dark style coats. New variation of the Wedding Dress! Play Advance Quests with Level 80 Enemies! Pay Additional Advance Capsules to increase the RISK. [Persona] and Doppelganger [Apprentice] can appear on the field. Let’s Bet and make a fortune! New Casino Client Orders and Casino Prizes! Costumes, accessories, weapon camos, and voice tickets from popular Shining Resonance characters. What will happen when you collect all the rings in the lobby? 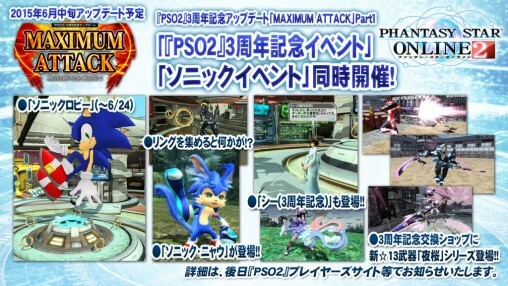 Third Anniversary Xie will be appearing in the lobby handing out COs.
Sonic Nyau may appear on the field. 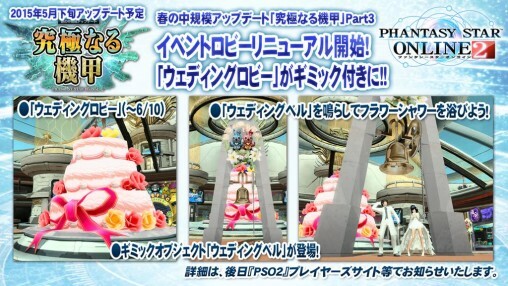 ★13 “Yozakura” Weapon Series at the Third Anniversary Exchange Shop! “Yozakura” (alt: Night Cherry Blossoms or Night Sakura) weapon series. An “All Star Quest” taking place in the Darker’s Base. 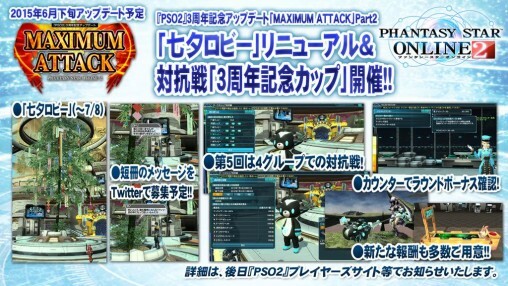 Maximum Attack interlocking WEB event begins! Arks Ship Competition #5: Third Anniversary Cup! Ships will be split up into 4 groups. You can check out Round Bonus info at the Quest Counter. Read Tanzaku messages from the Bamboo Tree. (Sega is accepting submissions from Twitter). 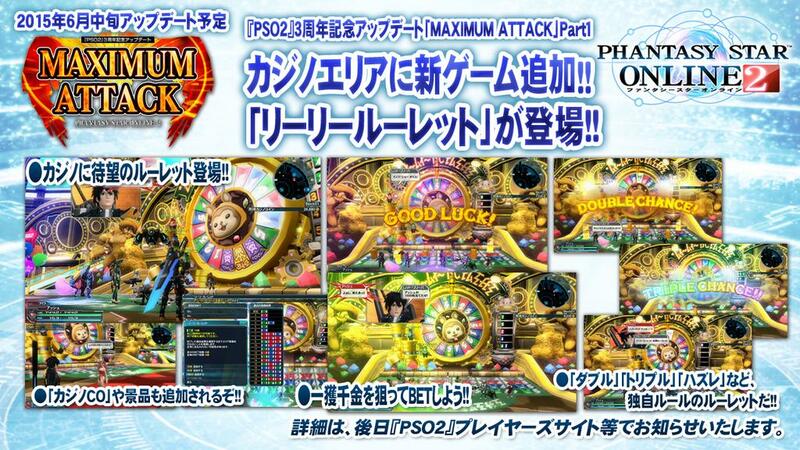 New Scratch: Magical Prism Phantasm. 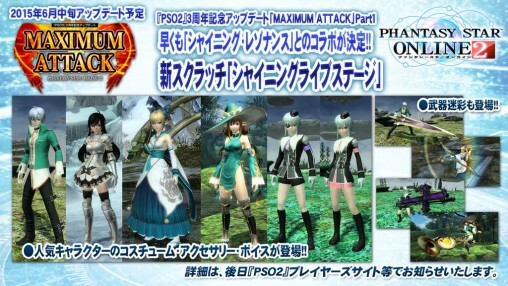 Luvia and Miyu’s Costumes, Hairstyles, Accessories, and Voices. 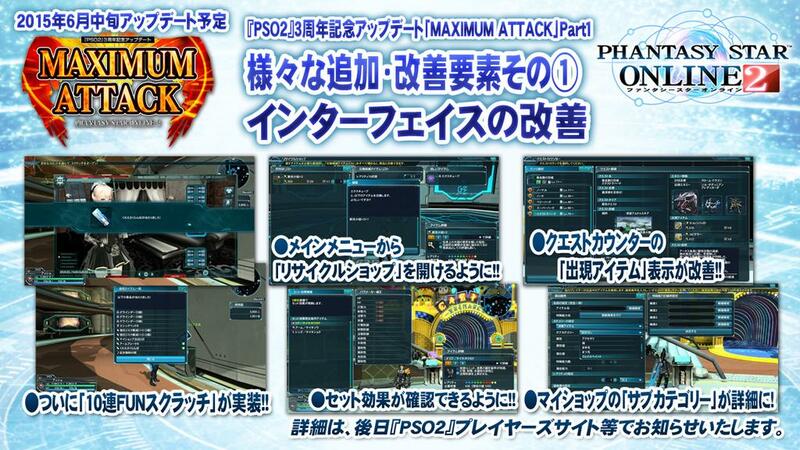 Weapon Camos and Room Items will appear as well. 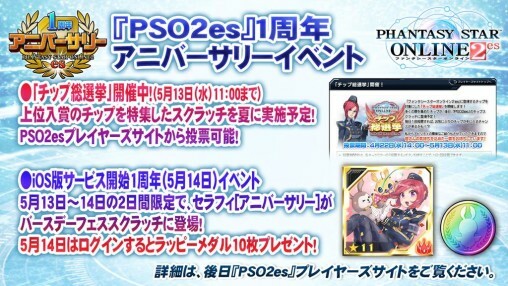 iOS Service Anniversary Event (May 14th). 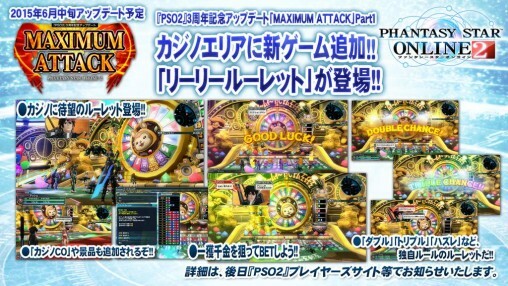 Seraphy [Anniversary] appears in the Birthday Fest Scratch! Earn 10 Rappy Medals when you login May 14th! 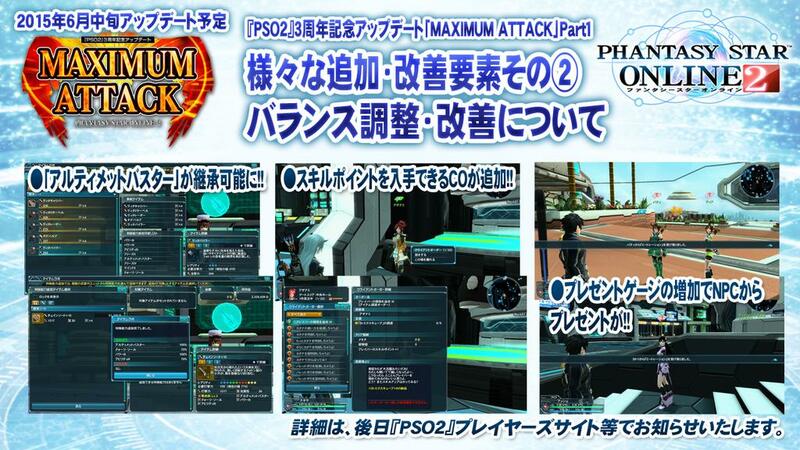 Earn a PSO2es exclusive 11 star Unit by trading in 20 Rare enemy chips. Get a [Dark Dual Blades Intensif.] Chip by trading in 15 scratch items. Suzuhito Yasuda’s costume, NPC, and weapon camo designs will be implemented during an update in July. 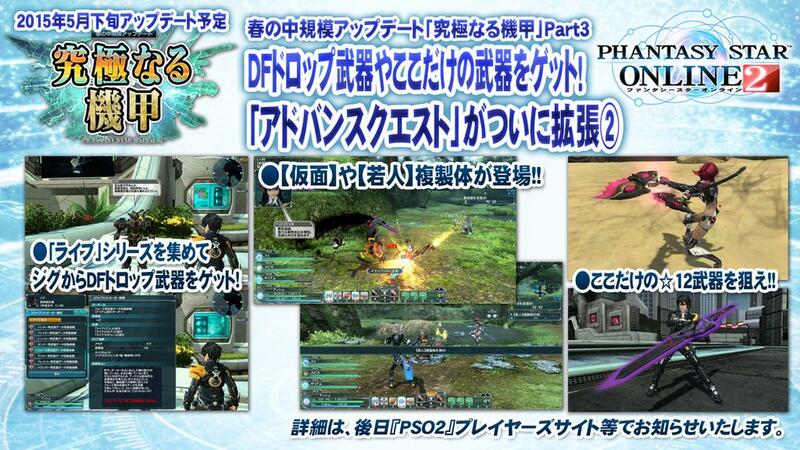 Chips will appear in PSO2es as well. 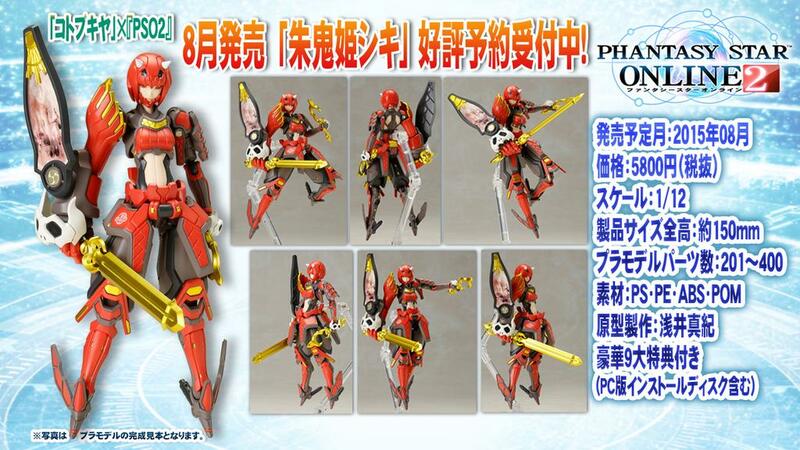 Masaki APSY’s “Red Oni-Hime Shiki” will be available in August! 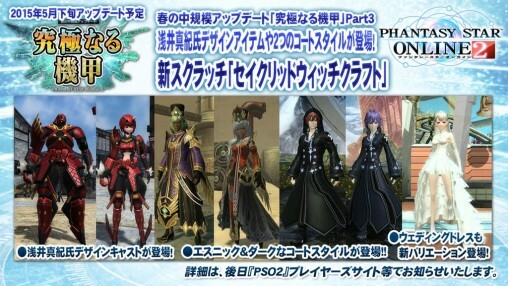 The Plastic Model will appear in-game as an NPC. 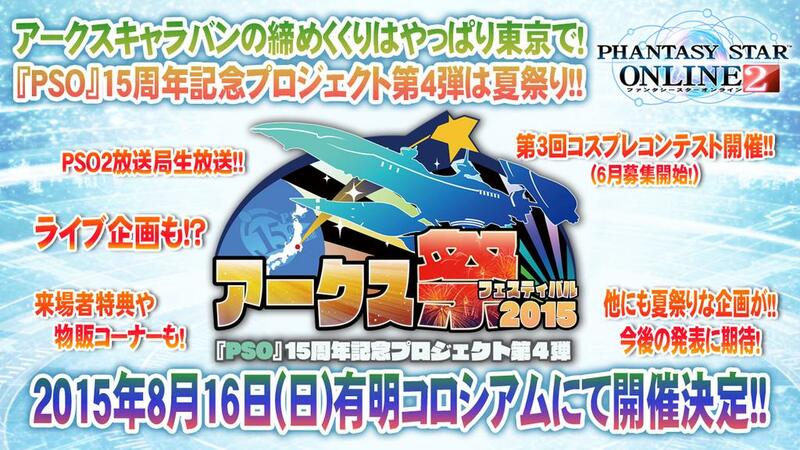 Arks Festival, live at the Ariake Coliseum in August! 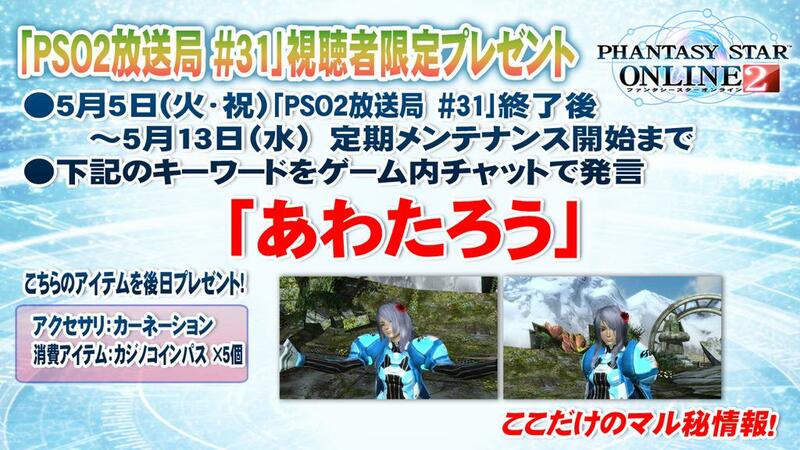 PSO2 Live Broadcast and 3rd Annual Cosplay Contest! No kanshasai or GP this year? …looks like sega mixed up the models with the nox series DBs and daggers. and this is what. 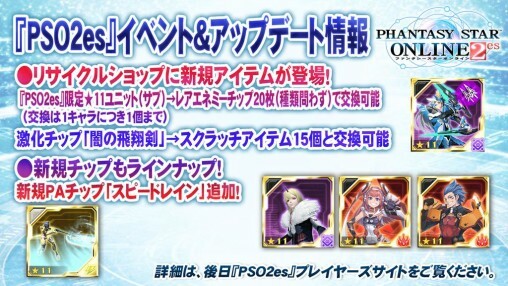 six fate/whatever collabs now? nasu’s rollin’ in cash here, guys. I feel almost vaguely cheated. 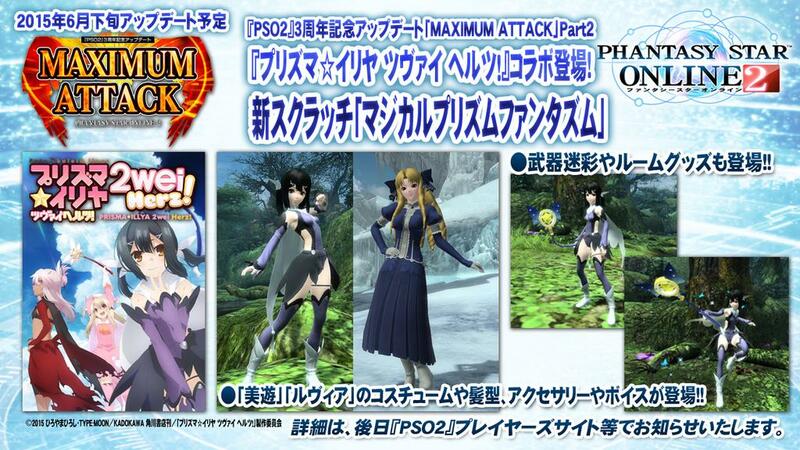 they claimed they’d be revealing a “HUGE HUGE HUGE” collab, but I see nothing special. With all these little changes to old systems happening, I can’t help but wonder when the camo system will be fixed so that we can actually equip more than one camo? It’s not going to be “fixed” as long as its an equipment slot. Was I the only one that noticed the snazzy, updated version of Pioneer 2 in the background when they revealed the Humar and Hunewearl outfits? 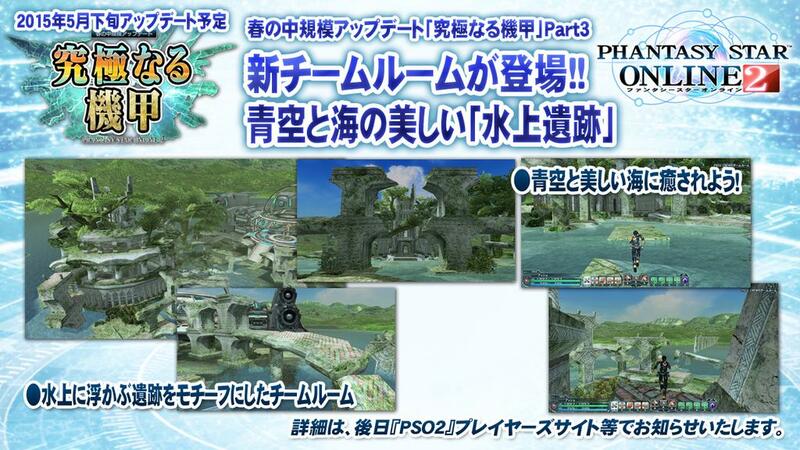 Is that going to be a playable area at some point, anyone know? Oh sweet, guess I missed that somehow. o.o Well thanks for the heads up on that. Since it’s not listed and no one’s talking about it, I thought I’d mention that you require 5 Ultimate Busters in order to transfer the ability. At the very least, it’s a guaranteed 100% chance to transfer, and they’ll also add one more fodder slot, so you can use 6 weapons instead of only 5 (i.e. 5 weapons to transfer Ultimate Buster onto your weapon + 1 extra slot for any extra abilities/boosts). What year even is this. so you’re trying to say that this monster, literally named “sonic-nyau” isn’t a sonic ripoff? it sounds like you’re the one who’s confused. Indeed, Nyau’s a monster created for the original phantasy star, the sanic-thing they made is just a Sonic themed Nyau, that isn’t a ripoff. Unless of course you take that as a ripoff, in that case they made a lot of them with Fate/Stay, Hatsune Miku, Attack on titan and whatnot. 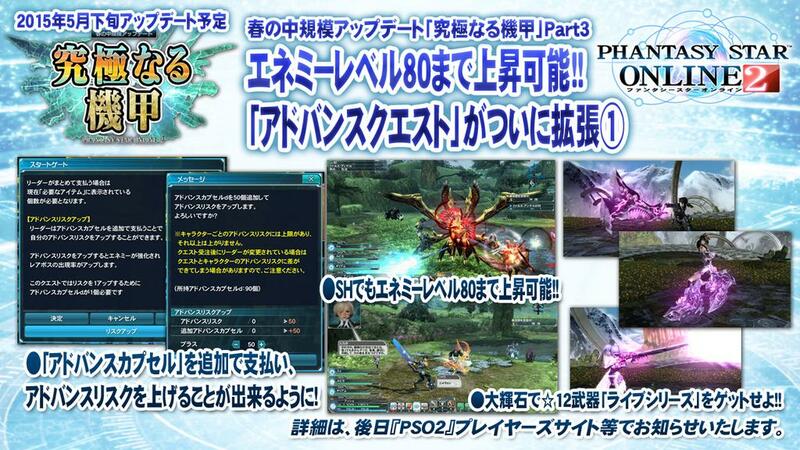 No, Myau is the thing created for Phantasy Star. It even says so in the picture linked above. 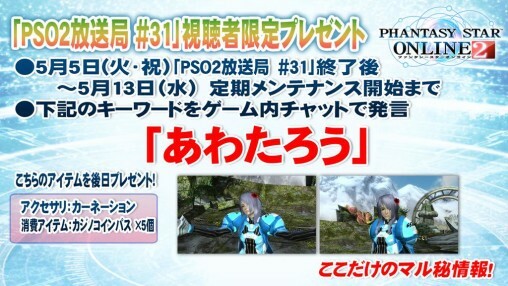 Nyau is the thing they made for PSO2, though it’s obviously based off of Myau. More importantly, why is any of this a point of contention in the first place? Who cares if it’s a Sonic ripoff? It’s Sega. Sega owns both IPs. They can do whatever they damn well please with them. Actually, the PS1 character was ミャウ /Myau; the PSO2 one is ニャウ/Nyau. You make no sense. Holy crap. what do you expect people to call him? his name is literally “loser”. that’s what 敗者 means. loser, vanquished, defeated, etc. it’s a wordplay. the japanese love wordplays. of all the things to call the western userbase out on, you pick the one time that they aren’t getting something wrong. TECHNICALLY it is supposed to be Dark Falz Luther. However, all of the Dark Falz Epitaphs are something different from how they pronounce them due to some dumb anime/manga thing that has no equivalent the vast majority of languages. They broke this rule and kept [Loser] because Loser and Luther are kinda Homonyms in spoken Japanese, and that the patch team did not want to pass up on this pun. Not to mention Old Apprentice in the final chapter of ep2 while talking to Luther calls him [Loser] as a sly insult that Luther does not pick up on. not really nitpickin but I just wanted to put the whole story out there as I have heard it. 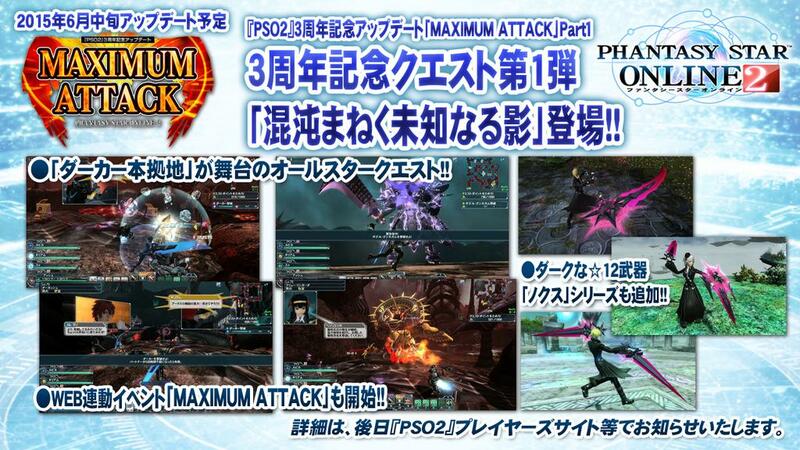 Dark Falz [双子] Is [Futago]. Futago means “twins”. This might not be directly related, but who knows. There is a fancy thing in manga when there is a written kanji word, but a side kana nearby reads something possibly entirely different. It mibht be closer to the meaning in this particular context, or rather imbue the phrase with even more meaning than its possible to tell quick enough. The vagueness of the language allows that, so native playerbase doesn’t have issues wtih duality, maybe. that’s pretty much what’s going on; if pso2 wasn’t voiced, the first time the resident cosmic horrors showed up their kanji titles would probably have those furigana things telling you how to read them. elder is really the only one where it really diverges all that much from a reasonable contextual interpretation of the kanji, though. . .
the only reason it’s loser is bc the ppl making eng patch decided. Haisha does not mean loser. And jp. Don’t call ppl Looooooserrr! That’s very much an American insult. Haisha means “defeated” Google’s translate… says loser, it also calls rappies Crappies. And if it DID mean loser.. so ppl are calling him dark falz loser[loser]. Makes perfect sense. 敗者 = haisha = loser, one who loses, defeated person, vanquished, etc. If you listen carefully to the translation when Regius calls him by Luther and Loser, you can hear the pronunciation difference. He calls Luther by his name, and then calls him by his Title, when he talks about using his power as Dark Falz [Loser] to revive some one Regius cared about. at this point, zarixx, I’m laughing. because I’ve never used the eng patch. and within minutes of seeing the kanji he used I had looked them up and seen that it meant “loser”. and here we have this chucklehead who thinks that nobody who speaks english and plays pso2 does so without the eng patch, and that nobody who speaks english and plays pso2 is capable of knowing anything of japanese, and subsequently that talks about anything in pso2 does so entirely based on what the eng patch says. I don’t have the highest view of the eng patches. I think that agrajag and the story translation people like to stray too far from “making it so people who can’t read japanese can understand the game” into “localizing”, making up alternate names for things when they feel like it (thrillerplode being labelled “thrillsplosion” for god knows how long as an inconsequential example), and so on… but even at my snobbiest I’m not going to kneejerk “herp the patch used it so it must be wrong” like that guy up there. of course, I tend to ‘grain of salt’ even sega’s romanization choices. these are the guys who named a guy “clotho”, as in one of the three fates from greek mythology, in the same lobby as someone named “lachiesis”, as in another of said fates… but insist on writing “chroto” in the credits, after all. this has nothing to do with google translate and everything to do with the fact that it is actually a legitimate translation. character for character, that would be shi-no-wa-ro–zo (or in a little easier to read format, shinowa rozzo). It still doesnt make any sense to me. Because is a obvious reference to Sinow Red. The translation for Luther is incorrect in quite a few places, pun intended or not. 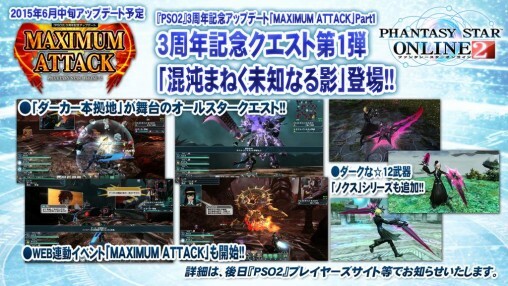 Yes, I’m aware his title is ダークファルス【敗者】, which means Dark Falz [Loser]/[Vanquished]/whatever (although “(The) Vanquished” sounds a lot cooler than “Loser” IMO), but that isn’t his in-game enemy name. We do not call Elder (エルダー) by his title (巨躯, Colossus), so why are we calling Luther that way? Even if it’s a “pun”, it’s still an incorrect translation for the enemy and soul name. Apologies if this was mentioned already, I didn’t read every post – the whole argument is old and dumb… it’s brought up on PSOW way too often.